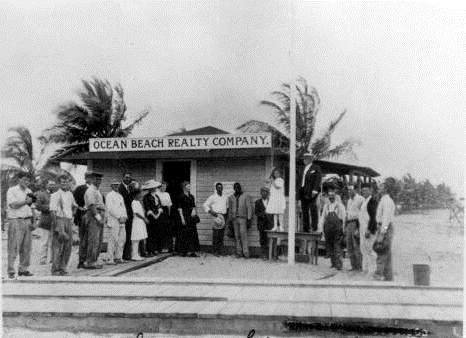 In February of 1921, Miami Beach was incorporated as a city for less than four years. Following the incorporation of Miami Beach as a town in March of 1915, the citizens of the Town of Miami Beach formally became the City of Miami Beach on May 1st of 1917. The City of Miami Beach was part of Dade County. The people of Dade County voted the county dry in October of 1913 on a very rainy night. The county consisted of not only today’s Dade County, but included parts of today’s Broward County as well. Therefore, the City of Miami Beach was founded during a time of county wide prohibition. However, that didn’t stop the owners of the Jungle Inn from providing a destination for those Miami Beach residents and tourists who were not opposed to partaking in the vices of the day. 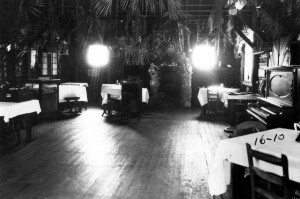 Although unclear of the exact date that the establishment began operations, many early Miami Beach residents referred to the Jungle Inn as the beach’s first speakeasy. 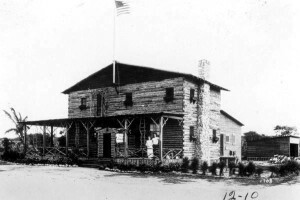 According to oral history of early beach residents, as well as, the last keeper of the Biscayne Bay House of Refuge, the Jungle Inn was located just a few hundred yards southwest of the House of Refuge. The Biscayne Bay House of Refuge was located approximately at today’s Collins Avenue and 72nd Street on Miami Beach. The last keeper of the House of Refuge was Laurence Frank Tuten, who took over duties in 1917. The Coast Guard officially discontinued the House of Refuge program after the conclusion of World War I. Although the program was discontinued, Tuten and his family remained in the building until the 1926 Hurricane destroyed it. 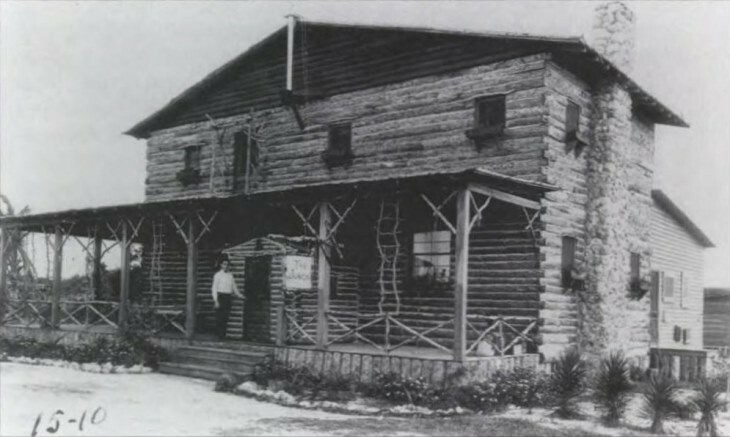 During the early 1920s, Tuten made note of the two-story log house that operated as the Jungle Inn in close proximity to the House of Refuge. Although there are variations of opinion on the exact location of the Jungle Inn, one account had it located at the southeast corner of today’s Abbott Avenue and Sixty Ninth Street. Other accounts had it located closer to today’s Sixty Seventh Street and Indian Creek Drive. It probably got its name based on its location. It was discreetly located in the middle of the peninsula’s undeveloped “jungle”. Given the nature of the business, it was important that its location and appearance were discrete. Technically, it was not located within the borders of the City of Miami Beach. However, it was considered an establishment that was very much a part of the Miami Beach experience at that time. The two story building was strategically erected north of the border of the City of Miami Beach. It was located in an area that was not included as part of the city until July 1st, 1924. According to the National Register of Historic Places, the northern border of Miami Beach was extended from today’s 46th street to its current location at 87th Terrace in 1924. The rustic, two story cabin was constructed of hewn logs. It maintained a residential motif by providing a front wrap-around porch. The jungle theme was enhanced by animal and alligator skins hanging on the walls. There were also tropical plants hanging from the ceiling. The first floor was considered the area where a visitor could discretely order and indulge in the alcoholic beverage of their choice. Normally the visitor would be offered ginger ale or lemonade. The drink they received would be far from straight versions of what they ordered. The second floor was the gambling den. As part of the unincorporated area of the peninsula, the proprietors felt safe operating such a business in a region that was divided on the topic of prohibition enforcement. Although Dade County had been dry since October of 1913, national prohibition didn’t begin until January of 1920. South East Florida would be one of many areas that loosely enforced the liquor laws. There were plenty of places one could indulge in alcohol consumption. The entire area was considered one of the leakiest regions in the United States during prohibition. However, the Miami and Miami Beach area was passionately divided on what was expected of law enforcement regarding liquor laws. The division of opinion crossed political party lines, but was particularly divisive between Miami’s the two largest local newspapers. The Miami Metropolis was owned and run by Bobo Dean, who was a strong advocate of prohibition enforcement. The Miami Herald was run and owned by Carl Fisher’s friend Frank Shutts. The Metropolis would be purchased by James Cox in 1923, but would take on the personality and beliefs of Bobo Dean until that time. Dean believed in prohibition and expected local officials to enforce the law. His paper would feature stories revealing the locations of speakeasy activity. The intent was to provide public pressure on officials to take action. Given the location of the Jungle Inn, it was difficult for local Miami Beach law officials to extend their reach to an area outside of their jurisdiction. This would change with growing pressure by those that strongly supported prohibition. On the other hand, the Miami Herald could be considered either indifferent or opposed to enforcement of prohibition. Carl Fisher, a good friend of the owner of the Herald, was adamantly opposed to prohibition. Although he was not a big drinker before the law, he was so outraged at the federal government’s reach in forbidding alcohol consumption, he defiantly opposed the law every chance he got. The Miami Herald would publish stories about law enforcement violating the rights of visitors and locals in the spirit of enforcing liquor laws. Fisher made sure that the Miami Herald would balance the coverage on liquor enforcement to counter the efforts by Bobo Dean and the Miami Metropolis. Opinions on prohibition were also divided by political affiliations. Prior to the elections of 1920, local Republican Party officials held a rally at Smith’s Casino in Miami Beach on October 27th. The speakers at the rally accused the Democratic county officials of not enforcing the liquor laws. The Metropolis would continue to publish articles exposing alcohol-related activities in Miami, Miami Beach and surrounding areas. Between newspaper coverage by the Metropolis and pressure from the Republican Party officials, a newly elected sheriff would be forced to take action in early 1921. One of Bobo Dean’s employees decided to go undercover to expose the Jungle Inn. She went by the name of Madge and was strongly opposed to what she considered immoral and illegals activities speculated about the Jungle Inn. She was intent on finding out for herself if all the speculation was real. On March 11th, 1920, Madge printed an article that shared her experience when she spent an evening at the speakeasy. Madge described the building as being located west of the old lifesaving station on Miami Beach. She went on to state that it was a lonesome big house, with only dwarfed sea grape trees and dreary scrub palmettos to keep it company. She approached the house shortly before midnight and slipped in when the two doors were unlocked and opened to let guests out of the first floor entrance. As she was seated, she was offered ginger ale that was considerably stronger to the smell than she preferred. Madge waited for a good time to discretely empty her illegal beverage between the cracks of the wooden floor. While she was undercover, she did not want to compromise her integrity. She observed others waiting in the downstairs area. Many were anxious to get to the second level to partake in the excitement of the roulette wheel. The proprietors were very careful who they agreed to let up to the second level. The stairs were heavily guarded and no one went up or came down without the permission of the sentries. However, when some men and women that the proprietors were familiar arrived, they were permitted to pass the guards and go upstairs. Madge followed the procession of those who were permitted to enter the second floor of the speakeasy. They must have believed that she was part of the group. She described the landing at the top of the stairs of providing a choice of three doors. She entered the door on the left where she found the roulette wheel that she had heard so much about. After an hour or so of watching the excitement of the guests playing roulette, Madge decided to leave. She walked back down to the first floor and the proprietors unlocked, unchained and unbolted the heavily guarded front doors and wished her a cheery goodnight. Little did the proprietors of the Jungle Inn realize that this woman’s experience would be a front page headline in the Miami Metropolis a few days later. Madge’s account of the events at the Jungle Inn brought the unwanted attention to the hidden speakeasy that the editor and writer of the Metropolis had intended. It required the conclusion of the elections of 1920 and a change in Dade County Sheriff in order for any action to be taken on what was learned from Madge’s expose. On February 3rd, 1921, F.E. 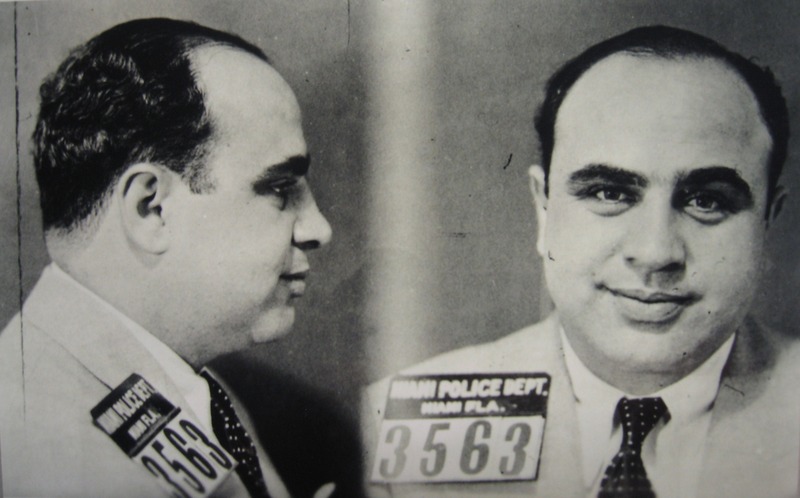 De Mandel and two other men were arrested during a raid on the speakeasy. De Mandel was the primary proprietor of the Jungle Inn. The judge ordered bail at $1,800 for De Mandel and $100 for the other two men. D.R. Maloney and R.S. Anderson were charged with being “inmates of a gambling resort and selling liquor”. It would seem they were arrested for working at the Jungle Inn as employees for De Mandel. The Sheriff and his deputies found gambling equipment that was purchased by De Mandel from Jersey City. Specifically, they found a roulette wheel and 125 pounds worth of chips on the second floor. In addition to the gambling equipment and alcohol found on premises, the law enforcement officials also discovered a couple of hidden closets and a trap door under a cigar counter. Nothing of note was discovered in any of the hidden compartments. There was no evidence on whether the Jungle Inn ever operated again as a speakeasy following the February 1921 raid. However, as Miami Beach developed as a city, there were plenty of other establishments that were willing to fill the desire for alcohol consumption and gambling. Carl Fisher’s Flamingo opened in January of 1920 and it was understood that alcohol consumption and gambling were permissible. Later in the decade of the 1920s, there were plenty of other places such as The Floridian Hotel, Palm Island Club, Miami Beach Kennel Club, Carter’s Gambling House, plus many other establishments that would partake in both gambling and alcohol consumption on Miami Beach. The two story building where the Jungle Inn operated would last until the mid-1920s. The Jungle Inn was razed during the clearing of land for the Atlantic Heights and Normandy Beach South sub-divisions. Just a few years after it opened, the Jungle Inn was paved over in the name of progress and development. It only remains in pictures and stories from those who enjoy reflecting back on a very different time in Miami Beach. Next time you are in the northern part of Miami Beach near either 67th or 69th streets, try to imagine a two story log building, operating as a speakeasy, in a pristine and undeveloped part of Miami Beach. It is hard to fathom that that stretch of land was ever considered a desolate jungle. 6 Comments on "Miami Beach’s First Speakeasy Raided in 1921"
Notes from the minutes of the Dade County Comission: The temperance movement was gaining influence and commissioners were asked to hold a special election to determine the public’s preference as to the sale of alcoholic beverages in Dade County. The final tally was 635 in favor and 1138 opposed, so Dade County was officially declared a dry county in December of 1915. Robert, thank you for reading the Miami-History Blog and taking time to comment. Based on a lot of research, I can confirm that Dade County was voted dry in October of 1913. See http://miami-history.com/dade-county-voted-dry-in-1913/ for an image of the headline in the Miami Metropolis from October of 1913. There were several attempts to reverse the dry vote of 1913, so the 1915 vote could have been one of those attempts. It would be interesting to see the meeting notes to understand the context of the 1915 vote. AMAZING story! It’s really unfortunate that remarkably historic places like this aren’t still here, and aren’t museums today! I wish they were. This building reminds me of the Browns Hotel in South Beach…pre-art deco. So cool! “Discretely” should be “discreetly”. They are both good words, but the latter is the correct one for use here. Good article! Shows how an ancient, primitive building once stood where high-rises do today. Thank you, Phillip. I mix those two words too frequently. I appreciate your approach to providing feedback.